Mobile Suit Gundam and model kits go hand in hand—the plastic kits arguably saved the series from obscurity and helped turn it into an anime legend. So inevitably the announcement of a new series in the franchise, naturally, that means there’s a whole slew of gorgeous looking toys to go with it. Mobile Suit Gundam: Iron-Blooded Orphans was announced on a global livestream by Sunrise earlier today, the latest series in the long-running anime franchise, ahead of an October broadcast in Japan. 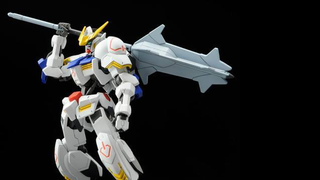 The main mecha of the series is the above Gundam Barbatos, a relic from an old war that the main cast—the titular orphans—discover has an adaptable Mobile Suit Frame allowing it to use parts from other mecha to upgrade itself. Does... does that Mobile Suit have an axe? Sign me up. Mobile Suit Gundam: Iron-Blooded Orphans will air in Japan this October, with the related model kits arriving shortly after. It shows Gunpla’s huge importance to the series that our best look yet at the new Gundam doesn’t actually come from the released trailer, but the toys themselves.